House mosquitoes are common and widely distributed in the US. The northern and southern house mosquitoes, Culex pipiens and Culex quinquefasciatus respectively, are frequently encountered and often closely associated with human habitations. House mosquitoes are members of the Culex pipiens complex. 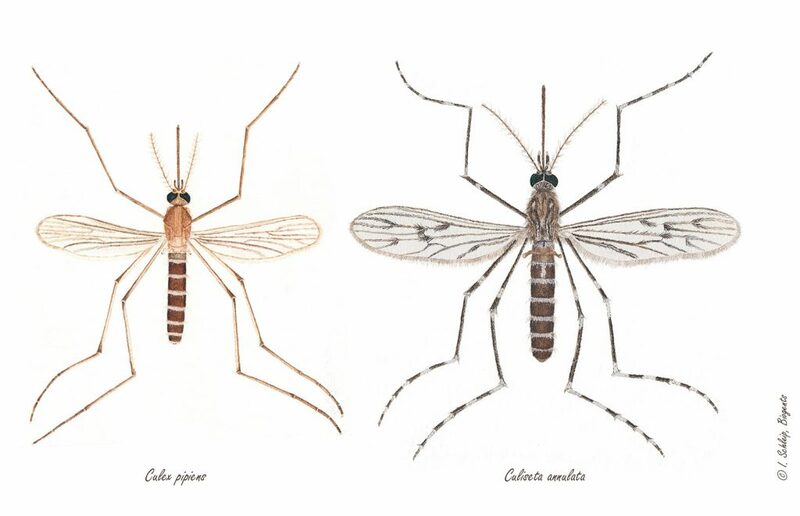 These mosquitoes are separate species, but interbreed to form hybrids where their range overlaps. Barr (1957) conducted a morphological analysis of specimens in North America and determined that pure Cx. p. pipiens populations were found above 39° north latitude, and pure Cx. p. quinquefasciatus populations were found below 36° north latitude, with a hybrid zone consisting of both subspecies and hybrids located between 36° and 39° north latitude. In a more recent study using microsatellite markers, Kothera et al. (2009), examined Culex populations along a north-south transect from Chicago to New Orleans. They found that the hybrid zone extended further north and significantly further south than was suggested by Barr, but pure forms still existed at both ends of the range. House mosquitoes are common in urban and suburban communities as well as in rural areas. They breed in storm sewer catch basins, ground pools, ditches, animal waste lagoons, and other sites that are high in organic content. Larvae can also be found in man-made containers such as discarded tires, buckets, bird baths, wading pools, and rainwater storage containers. Culex quinquefasciatus is generally associated with water of higher organic content than Cx. pipiens. 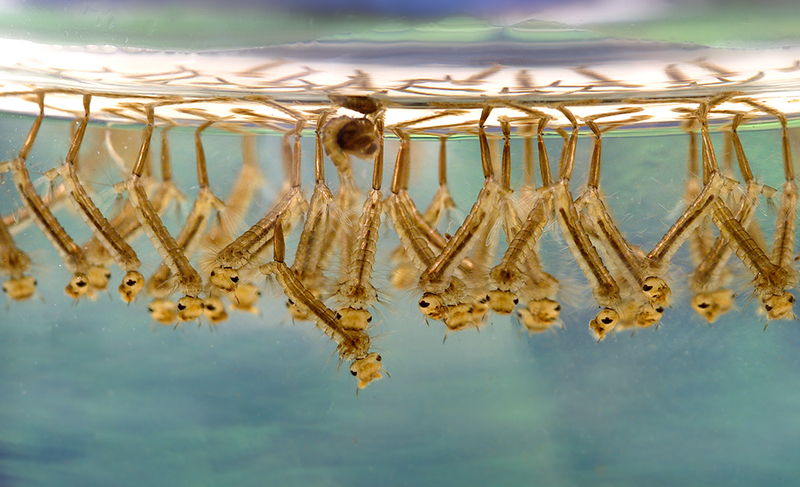 Female Culex mosquitoes typically lay their eggs in what is called an “egg raft”, which floats on the surface of stagnant water. An egg raft consists of 100-300 eggs that are laid one at a time and adhere to each other in a vertical orientation. Eggs hatch in 1-2 days and the larvae pass through four growth stages feeding on bacteria and detritus in the water. At the end of the fourth larval stage, they stop feeding and molt to the pupal stage. The length of time to complete development from egg to adult is temperature dependent, but on average, requires between 8 to 12 days in the summer. After the adult mosquitoes emerge from the pupal stage, they seek a place to rest while their wings and cuticle harden, search for a sugar meal from plants and mate. Following mating, the female seeks a blood meal, while the males subsist on plant juices and nectars. Culex quinquefasciatus females are opportunistic feeders, feeding on mammals and/or birds, while Culex pipiens have a more distinct preference for birds. They typically bite at dusk, after dark and throughout the night. By day they rest in vegetation, catch basins, culverts, woodpiles, garden sheds, chicken coops and other protected areas around the home. After a female mosquito digests the blood meal and the eggs develop, she seeks a suitable place to lay her eggs, and the cycle begins again. A single female will take multiple bloodmeals over her lifetime and can lay egg rafts following each one. Adult Culex mosquitoes do not fly far from where they develop as larvae and females may return to the same or nearby larval habitats to oviposit. While Culex often remain within a very localized environment, females may travel considerable distances from resting sites to search for blood hosts. In northern areas, Cx. pipiens, unlike other mosquitoes that die after the first hard frost in the fall, seek shelter in protected environments like storm sewers, culverts, caves, crawlspaces and basements. Inseminated females spend the winter in diapause, a state of arrested development triggered by environmental factors that allows adult females to overwinter in cold climates. In southern regions, Cx. quinquefasciatus is active throughout the year, although larval growth rates may slow and adult populations may be reduced during cooler months. Members of the Culex pipiens complex, Cx. quinquefasciatus and Cx. pipiens, are vectors of West Nile (WN) virus and St. Louis encephalitis (SLE) virus. Both species have also been incriminated as vectors of dog heartworm, Dirofilaria inimitis. Members of the complex may also be important pest mosquitoes, particularly in urban areas and in association with feed lots and farms. Culex erraticus is a small, dark colored species, found primarily in the southeastern United States. Larvae occur in semi-permanent and permanent pools including grassy shallow margins of ponds, lakes, marshes, ditches, floodwater areas, streams and rice fields. Adults are encountered from May to October and may bite people at night in outdoor situations but they seem to prefer to feed on birds. Flight range is short, only up to 1/4 mile. Due to their fairly indiscriminate feeding habits, field collected samples have tested positively for eastern equine encephalitis (EEE) virus, St. Louis encephalitis (SLE) virus and West Nile (WN) virus, as reported by the CDC. Culex nigripalpus is found in warm, humid coastal habitats from North Carolina to Texas and up the Mississippi River basin as far north as Kentucky. Females prefer to lay eggs in freshly flooded roadside ditches and agricultural furrows, grassy pools, and marshes of a semi-permanent or permanent nature. They are also occasionally found in wheel ruts, leaf axils of plants, and artificial containers. Culex nigripalpus is an opportunistic feeder, feeding on vertebrates ranging from tree frogs to humans. Host selection is greatly influenced by the relative abundance of hosts found in the mosquito’s foraging habitat. Its feeding preferences have been shown to change over the seasons, feeding on avians in the winter and spring and mammals in the summer and fall. Females seek hosts and blood feed mainly during the crepuscular periods before sunrise and after sunset. Cx. nigripalpus is considered a vector of Eastern equine encephalitis (EEE), St. Louis encephalitis (SLE) and West Nile Virus WNV and dog heartworm. Culex restuans has a widespread distribution and is very common in the eastern and central United States. Adults are active by mid-May and populations usually peak by July. A second peak is often seen in the fall, corresponding to the overwintering adult generation. Adults of this species are similar to Cx. pipiens in appearance and are often difficult to differentiate. Larvae are common in semi-permanent and permanent pools including road side ditches, floodwater areas, grassy pools, pools of streams, woodland pools, tire ruts, hoof prints, discarded buckets, tires, catch basins, sewage effluent and septic seepage. Culex restuans feeds primarily on avian hosts, and is not generally attracted to humans. This species is considered a vector of St. Louis encephalitis (SLE) and West Nile Virus (WN). Culex salinarius has a distribution that extends over most of the eastern and central United States from Maine south to southern Florida, west to central Texas and north to the lower Great Lakes region. Virtually any freshwater habitat with dying vegetation can support Cx. salinarius larvae. Larvae occur in fresh or foul water, in grassy pools, roadside ditches, ponds, and occasionally in stump holes, cattle tracks, rain barrels, and other artificial containers. In general, Cx. salinarius feeds on both birds and mammals, but its host feeding pattern is thought to be opportunistic and influenced in large part by host availability. Adults rest during the day in outbuildings and other similar shelters. This species readily bites humans outdoors and has been reported to host seek well into the fall often pestering hunters in duck blinds during the month of November. Overwintering is thought to take place in natural shelters such as muskrat huts and animal burrows. Laboratory studies have shown that Cx. salinarius transmits WNV efficiently by bite. The virus has also been isolated from numerous field collected specimens. Based on its vector competence and feeding preferences, Cx. salinarius may be an ideal bridge vector between the enzootic avian cycle of WN and mammalian hosts. Culex stigmatosoma occurs in California and the Pacific coast. In California, it is known as the “banded foul-water mosquito” and is a common pest. This species breeds in natural and man-made polluted waters. Culex stigmatosoma feeds primarily on birds but may occasionally bite humans. It is thought to play a role in arbovirus disease ecology and may transmit St. Louis encephalitis. Culex tarsalis is a common and widely distributed mosquito in the central and western US. The larvae tolerate a wide range of water conditions and may be found in agricultural wastewater, irrigation systems, ditches, ponds, livestock drinking troughs, ground pools, marshes, pools in stream beds, alkaline lake beds, fresh and saline wetlands, and oil field run-off. The preferred hosts of Cx. tarsalis are domestic and wild birds, while humans, cows, and horses are generally incidental hosts. In spring, when population abundance is low, most females feed on birds. During late summer, when populations are high, mosquito-avoidance behavior by birds diverts many females to feed on mammals including rabbits, horses, cattle and humans. This host shift may be important in virus transmission to horses and people. Biting is generally at dusk and after dark. They rest in sheltered areas during the day and, like most Culex mosquitoes, survive the winter by hibernating. Culex tarsalis is an important vector of arboviruses in the United States. 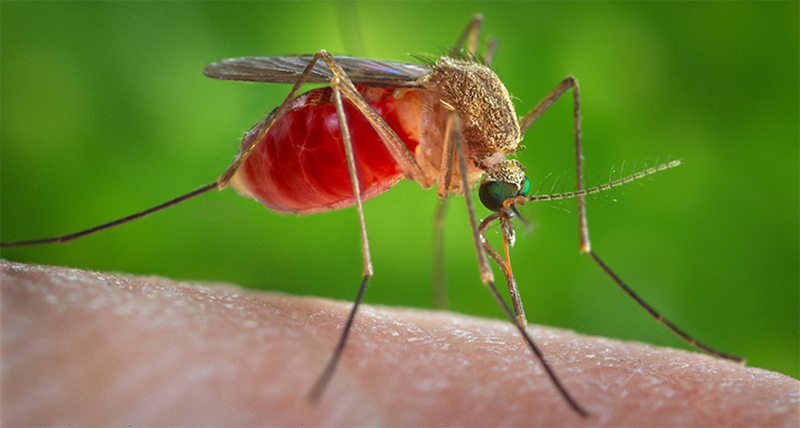 This mosquito has been implicated in the transmission of West Nile virus, St. Louis encephalitis and western equine encephalitis. Culex territans distribution in the US extends from Alaska and Canada south through most of the United States. Larvae are found in semi-permanent and permanent pools containing emergent grasses in streams, swamps, and ponds. They do not favor foul water. Females have a short flight range and a preference to feed on cold-blooded vertebrates, particularly frogs. Culex territans appears early in the spring and it is not uncommon to see this species feeding on Spring Peepers during the month of March. This species overwinters as adult females in protected places. Culex territans has no known economic or medical importance. Barr AR. 1957.The distribution of Culex p. pipiens and C.p. quinquefasciatus in North America. Am. J. Trop. Med. Hyg. 6:153-165. Burkett-Cadena ND. 2013. Mosquitoes of the Southeastern United States. University of Alabama Press. 188pp. Darsie, RF Jr and Ward RA. 2005. “Identification and Geographical Distribution of the Mosquitoes of North America, North of Mexico.” University Press of Florida, Gainesville. Savage, H and Miller B. 1995. 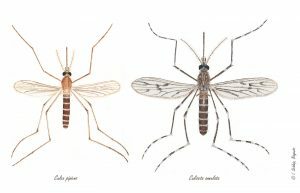 House Mosquitoes of the U.S.A., Culex pipiens complex. Wing Beats, Vol. 6(2):8-9. Savage HM, Aggarwal D, Apperson CS, Katholi CR, Gordon E, Hassan HK, Anderson M, Charnetzky D, McMillen L, Unnasch EA, Unnasch TR. 2007. Host choice and West Nile virus infection rates in blood-fed mosquitoes, including members of the Culex pipiens complex, from Memphis and Shelby County, Tennessee, 2002–2003. Vector-Borne Zoonotic Dis. 7: 365-386.